I had a 4-card afternoon yesterday! That doesn't happen very often, but this time it was simple, because I had two specific goals: first, to make Anita a birthday card. Second, to use some of the items that we exchanged or made at our playdate last weekend. Today is Anita's birthday and it will continue sometime into next week, when she will finally receive this birthday card from me. I'm going to claim 'wedding busy-ness' as my excuse! lol! 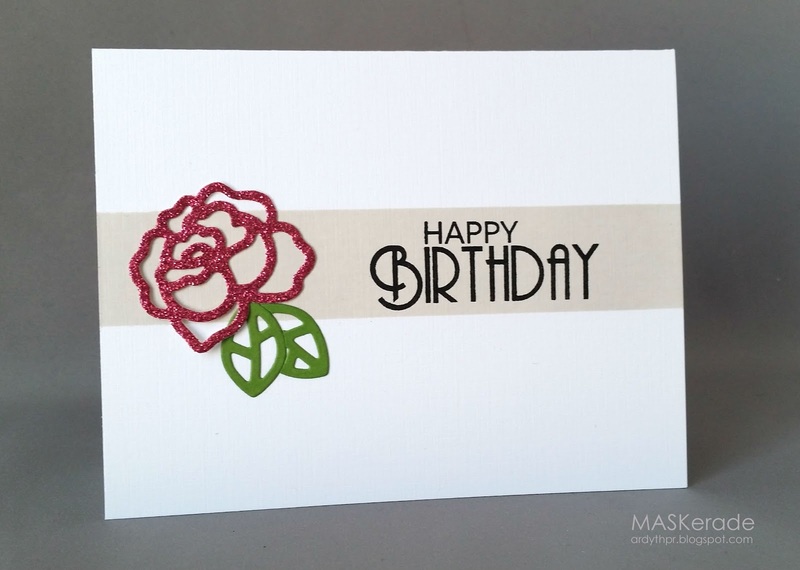 For this card, I used a Paper Smooches die cut rose and leaves that Emily put into a card kit. I cut one of the leaves so that they could nestle together, looking overlapped, when they're really not. I also used that amazing linen cardstock that Emily raves about - she gets it from Ellen Hutson. I sponged a PTI Soft Stone stripe on the card base and stamped my sentiment in Versafine Onyx. Anita - I wish you a very, very happy birthday, my friend! My next card shows the panel I embossed with embossing paste. Yes, me! I did that! And it was FUN! I had already sponged a panel with distress inks and then used the pearlescent embossing paste that Emily brought to my house and a stencil of falling dots (can't remember who made this one - can you help?). I wanted to really let the panel shine, so I simply inlaid a black Paper Smooches thanks die. 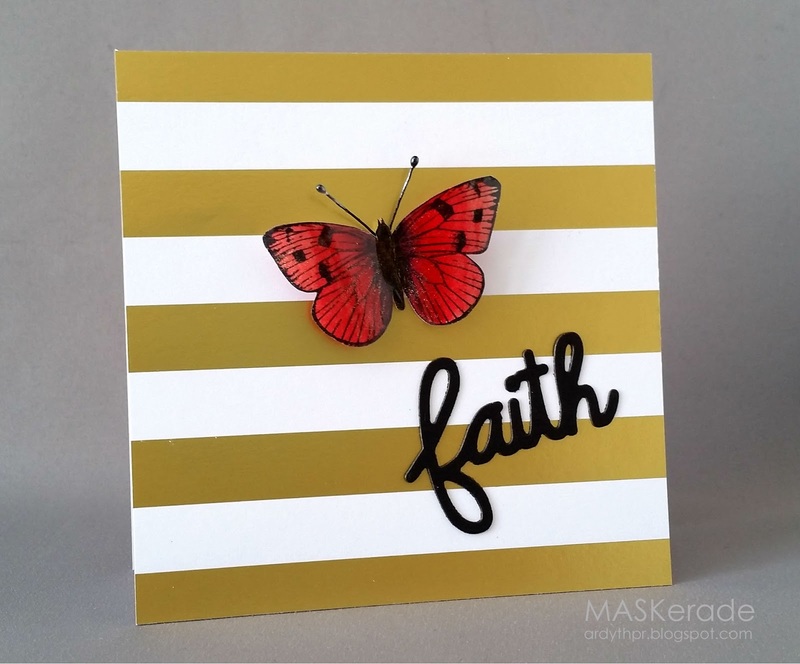 Next up, a very simple card using some beautiful, striped card stock that Natasha brought, along with a butterfly that she had coloured and applied glossy accents to (it was attached to a little gift - too beautiful not to use again... and again!). I finished it with a black Paper Smooches die cut that Emily brought. 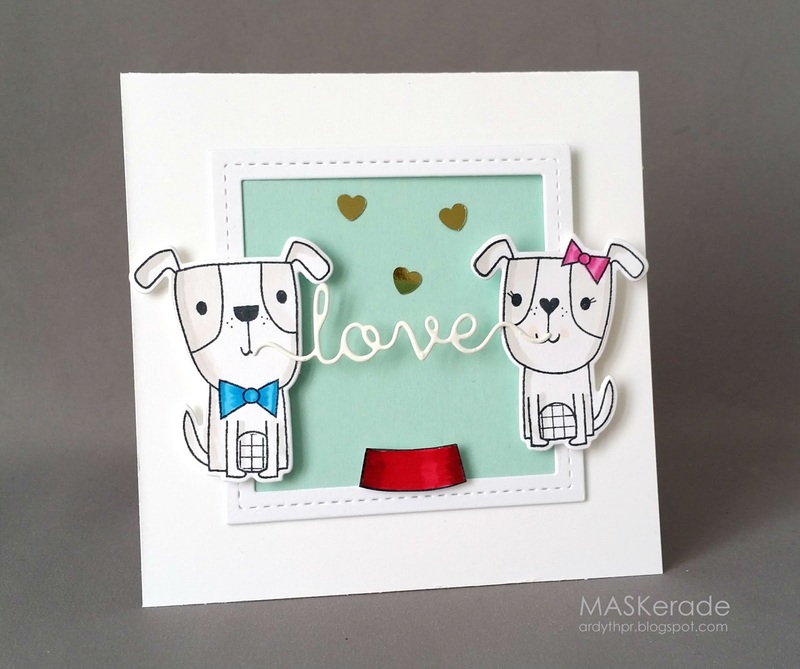 Finally, a Lady and the Tramp themed card using some Reverse Confetti stamps and dies that Tracey brought, along with the little gold sequins. The frame and the aqua paper came from Natasha (I cut down the rectangular frame to make a square - I made sure to keep the cut lines behind the dogs). I added my own Clearly Besotted Love die - I'm sure they were not thinking 'spaghetti' when they designed it! lol! These are absolutely fabulous Ardyth! LOVE the spaghetti love... totally made me smile. Look at all those fun goodies from your play date Ardyth. You rocked them! Each one is different, each one is first-rate! Each card is a dream, Ardyth... but for me? your spaghetti does did it!!! So stinking cute!!! Those are some fabulous cards! Wow! What gorgeous ards you've made wiyh the goodies you received. Love them. So much awesomeness! Loving that gorgeous dotty embossing paste creation and your Lagy and th eTramp card totally made my day! Thanks so much, Ardyth ... such a beautiful, glimmering rose with it's nestling leaves ... and a fabulous CRM-ish sentiment ... all so perfect against the sponged panel! Looking forward to having this beauty IRL! Fabulous sponged background, gorgeous with the shimmery EP ... lovely butterfly against those rich gold stripes ... and that spaghetti love is so cute (and clever!). Such a brilliant trio of cards! Wow! Haven't you been busy? (Hangs head in shame.) I have not made anything with all the sweet goodies we exchanged. I LOVE that you used the butterfly. I have a ton more I'm thinking I should bring the next time I see you. At least they will get used. Haha! Love all your cards. But that last one made me lol! So clever. Okay, I got a little confused when I got to the bottom of the post. I saw three brilliantly graphic cards that were truly Ardyth, and then I saw the awesomely adorable doggie card and thought, "Where did that come from?" I love it, though, and it shows your versatility, especially using the die for spaghetti. You had an awesomely creative day Ardyth! Each one special in it's own way! Productive day with great results! Love the HB sentiment and sparkle on Anita's card! Gorgeous shading on the Thanks card - the embossing looks like drops of rain. A nice clean background was definitely the call for the butterfly! Lady & the Trammp rock...especially the 'love' spaghetti! So clever and so cute! Oh my....so many fabulous and fun cards! I love the one you made for Anita, so sweet.